After the war, Aldrin ended up attending the school he'd turned town previously and earned a doctorate in astronautics. 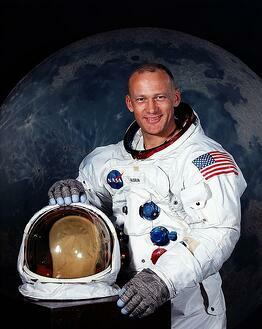 Though it was a requirement that all successful astronaut candidates have worked as a test pilot, Aldrin had not. As a result, his candidacy was rejected twice before the requirement was waived, and Aldrin began his dream career as an astronaut in 1963. While his most famous moment came six years later when he landed on the moon in 1969, Aldrin continued to work for NASA until 1971. He retired from the Air Force in 1972. Ideal for children's book collectors, this 2005 picture book is illustrated by Wendell Minor who is known for his collaborations with wife Florence Minor on books like If You Were a Penguin. Minor also illustrated Mary Higgins Clark's children's books. This charming picture book details events in Aldrin's life that led up to his becoming an astronaut, and it draws connections between childhood activities, like rock collecting, with specific experiences he had as an astronaut, like taking samples of moon rocks. This book—co-written with Ken Abraham—not only gives a fantastic, "insider's" look at the Apollo 11 mission and a firsthand account of what it is like to walk on the moon, but it also reveals an honest look at the life of Aldrin himself. Aldrin speaks candidly about settling into life after one of the most important moments in both American and human history. He speaks openly about the fame that comes from living through such an event and the sharp contrast between that fame and the struggles that came with the end of his Air Force career. This book is worth having on your shelf not just as one of Aldrin's titles, but as a realistic and poignant look at living life with depression and alcoholism. This 1989 book written with Malcolm McConnell pairs Aldrin's first-hand account of his work on the moon landing mission with anecdotes and interviews from other people involved with NASA at the time. This combination of experiences creates a comprehensive look at the ins and outs of the mission and makes a great addition to collectors interested in both science and history. After teaming up to create his autobiographical children's book Reaching for the Moon, Aldrin collaborated once again with illustrator Wendell Minor on his picture book Look to the Stars. Look to the Stars provides a charming overview of different discoveries throughout history that culminated in his historic mission, as well as imagining future possibilities. This 2009 book is a worthy addition to children's book collections because of its combination of history (both ancient and modern) as well as its encouraging look at where space exploration could take us in the future...especially if the children reading the book dream big and work hard to understand the world around them and our place in the universe. 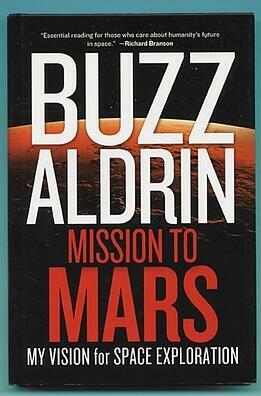 Aldrin's 2013 book written with Leonard David presents the engineer's detailed plan on how to get men on Mars by 2035. This book presents Aldrin's ideas on what needs to be done both on earth in terms of policy and at NASA. While both imaginative and thought-provoking, this book also manages to stay grounded due to Aldrin's scientific knowledge and experience. Anyone remotely interested in space travel and book collecting will find this a must-have for their collection, especially if, like Aldrin, they wonder just how far science can take us and how far the human race is capable of exploring.